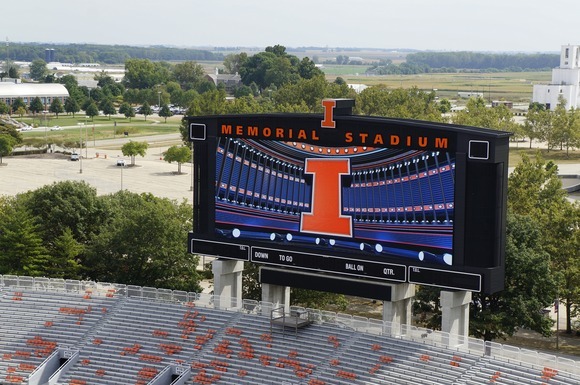 CHAMPAIGN, Illinois – With a total seating capacity of 60,600, Memorial Stadium at the University of Illinois was built in 1923 and is home to the University’s Fighting Illini football team. While the stadium’s history is a huge part of its charm, the outdated audio system was not. To that end, systems integrator Daktronics recently designed and installed the new audio/video systems at the stadium, implementing HARMAN’s JBL VLA Series loudspeakers along with Crown I-Tech HD amplifiers to power the audio system. The new system is integrated with existing BSS Audio and Crown back-of-house equipment. The new main bowl audio system is integrated with the new scoreboard and consists of two line arrays, each equipped with six JBL VLA601H and two VLA901H loudspeakers. Two JBL PD5212 loudspeakers are used for downfills. Also, nine AC28’s were installed to fill shadowed areas under the East upper deck. The system is powered with 12 Crown I-Tech 4x3500 HD and five Crown I-Tech 9000 HD amplifiers. These were installed in accordance with the existing BSS Audio Soundweb London BLU-80 system and Crown CTs amplifiers. The challenge for Daktronics however, was to incorporate the new equipment into the structural appearance of the stadium. “Daktronics structural engineering had a defined ‘look’ for the entire scoring/audio/video board structure during the beginning design phase of this project. I was tasked with designing a sound system to fit within this look, and thanks to the modular design concept of the JBL VLA Series, this was easily accomplished,” said David Sturzenbecher, Audio Project Engineer for Daktronics. “The integration with the existing BSS Audio network was crucial to saving cost as there was no need to add additional DSP components. We did provide new user interfaces for the existing BOH system so the customer can easily see any system issues and make quick adjustments,” Sturzenbecher added.